Sophie Logan was awarded the SAROA Apprentice Award for 2018. She admirably met the criteria that we set of going the extra mile for owners. Following a short career on the Victorian Picnic race circuit she decided to further her career as an apprentice here in SA. After completing the required number of rides in trials, she recently obtained her ticket to ride on the provincial circuit. 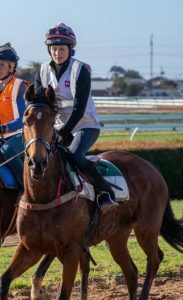 She won on Euro Gold at Naracoorte, her second professional race ride and followed up three days later with a win on Owl On The Prowl in the Whycheproof Cup. While she was going through the process of obtaining her licence her master, Grant Young fell sick and has been hospitalised for more than two months. Sophie has been required to step up and help with the running of Grant’s stable acting as stable foreman, doing media interviews, strapping and interacting with owners while at the same time gaining her licence and commencing riding. SAROA congratulates Sophie on her achievements and wishes her every success in the future. Sophie was interview on the Vision Australia Punter’s Club by Tom Eglington and Mal James and audio of the interview is available below.